Options: 1 bottle 3 bottles $18.95 ea. 6 bottles $17.95 ea. 12 bottles $15.95 ea. 24 bottles $14.95 ea. Sunlight and Vitamin D - Recent scientific research has shown the importance of Vitamin D production via exposure of the human skin to sunlight. Due to the fact that many Americans avoid sun exposure for a variety of reasons, Vitamin D deficiency is now being considered an epidemic in this country. Scientific experts believe Vitamin D supplementation is the best way to reverse Vitamin D deficiency. Robert Barefoots Bob's Best Product Line provides this essential supplement. 90 - 5000 iu Tablets per bottle. 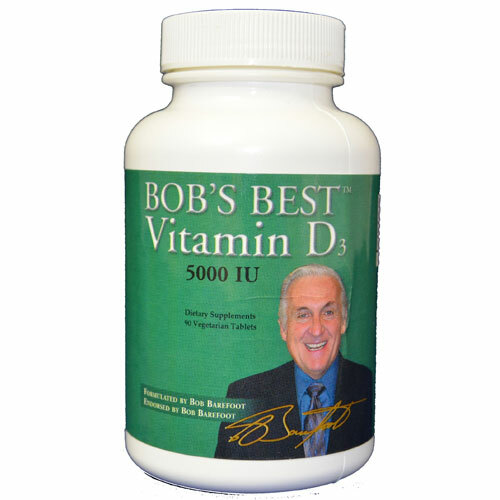 Click the videos button below to watch an interview with Bob Barefoot and Kim Estes on vitamin D3.